Arguably the most popular option on the diamond from the card maker, 2017 Leaf Trinity Baseball takes aim at the top draft picks and standout prospects. 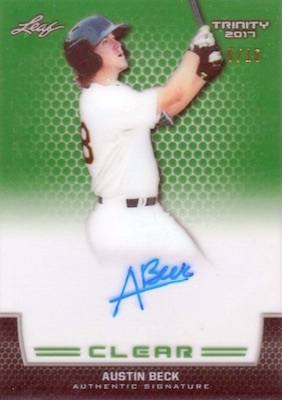 Every all-autograph box includes six hard-signed cards. Staying with the Leaf formula of just a few main designs, 2017 Leaf Trinity Baseball has a trio of on-card autograph sets to track down. Boasting the "single strongest checklist in the history of the brand," the choices include acetate Trinity Autographed Clear cards with a vertical orientation, and the horizontal Trinity Autographed Signature cards that allow signers a ton of room for an inscription, which most have. 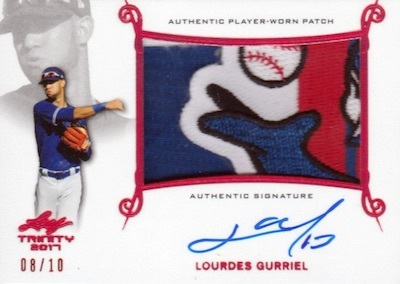 The Trinity Autographed Patch set replaces that open space with large player-worn swatches. Just as in the 2016 product, low-numbered parallels apply a subtle color change while amping up the rarity. 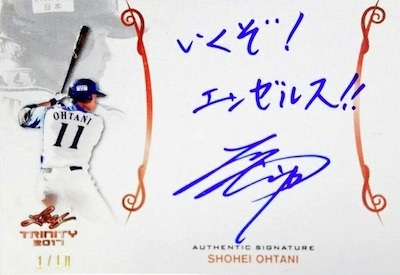 The final 2017 Leaf Trinity Baseball checklist includes signed cards from Shohei Ohtani, Rhys Hoskins, Ronald Acuna and Cody Bellinger, among others. 2017 Leaf Trinity Adam Haseley Auto Go Phillies! 2017 LEAF TRINITY TREVOR ROGERS P MIAMI ROOKIE INSCRIPTIONS ON CARD AUTO HOT! 2017 LEAF TRINITY HANS CROOSE P TEXAS ROOKIE CLEAR ACETATE ON CARD AUTO SP HOT! Shop 2017 Leaf Trinity Baseball autograph on eBay. 70 cards. Serial numbered 1/1. SPECTRUM PARALLELS: Platinum #/25, Red #/10, Silver #/5, Gold 1/1. SHOHEI OHTANI VERSIONS: Bronze #/10, Platinum #/7, Red #/5, Silver #/3, Gold 1/1. Awesome product!!! Opened 3 boxes, got Hoskins, McKay and Rosario Patch autos. 3 #/10 Clear autos… oh, and a Robles Patch Auto #/5. And some guy name Shohei Ohtani Auto #/10. Cards look great like always, sick patches. Can’t beat the quality of card for the price per box. 2017 Leaf Metal All-American Perfect Game Classic Baseball Sealed Box 8 Auto's!